I have just two more Emblazon titles lined up to share with you. I’ve been trying to read one from every author, but I keep finding myself drawn into entire series. Such is the case here. I read Stephanie’s Princess Kandake last spring, when I was screening authors to join me in the Emblazon group. Stephanie got an immediate invite! I then moved on to other books written by other possible members and eventually started reading my way through the Emblazon bookshelf. However, when I learned that book three of the Kandake series was about to release, I had to hurry up and read book two. I wasn’t disappointed. And I fully intend to get my hands on book three very soon! 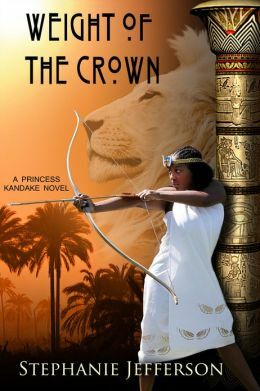 In book one, Princess Kandake of Nubia is chosen to succeed her father on the throne despite her desire to become a warrior. In Weight of the Crown, we see her further maturation as she must accept the rule during her father’s illness. Unfortunately, an arrogant prince from a neighboring country decides he wants Kandake’s hand in marriage—despite her decision to the contrary. I enjoyed seeing all the Nubians from book one return, strongly in character. Shen, the Scythian warrior, becomes a strong and endearing friend of Nubia. And I loved to hate Prince Gadarat, arrogant, prideful scum of a prince that he is. (Without giving anything away, Kandake has some deliciously malicious moments in that regard!) The history, the setting, the incredibly strong female lead, all make this a wonderful read. But I have to confess, one of my favorite things about the Kandake books is the very physical nature of the plot. The warriors, Kandake included, are always sparring, practicing, training, fighting, and flinging themselves on horseback. I have always been an athlete. I still keep myself strong and active, running, skiing, swimming, biking. The action in this book has me tense, gripping my fists, wishing I could join in. I want to wrestle, to fling an opponent to the ground, to grapple and tumble as I did when I was a kid. I guess I still get to do that…in my imagination. And I get to enjoy a great story while I’m at it! And can we say enough about the gorgeous covers? Two thumbs way up! **Since scheduling this post, I did read book three, and it’s treat as well. I give this entire series a hearty recommendation. That’s a good sign when you set out to review a book and read the entire series. Love that feeling. Like the action and story line of Stephanie’s book. Great cover! I didn’t think of it that way, Pat, but you’re right. Stephanie is an awesome addition to our author’s group, and I’m proud have this kind of quality alongside my own books.